Escape Disc is ticket to on-road versatility. Ride city streets or country roads. For commuting fitness or just for the fun of it. Confident upright geometry a flat handlebar and a wide range of gears give it a sporty ride quality. Easy handling and powerful disc brakes make it a great choice for navigating city streets or crowded bike paths in all types of weather. Whatever road or path you choose Escape Disc is always up for the adventure. TRANSPORTATION FITNESS AND FUN. ESCAPE DISC IS ALL THESE THINGS AND MORE. CHOOSE YOUR MISSION HOP ON AND GO. 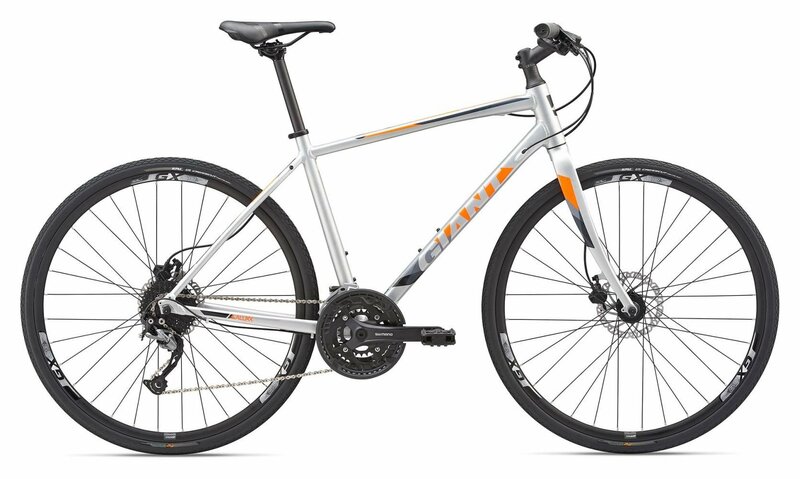 With its lightweight ALUXX aluminum frame and smooth stable 700c wheels Escape Disc is ticket to on-road versatility. Ride city streets or country roads. For commuting fitness or just for the fun of it. Confident upright geometry a flat handlebar and a wide range of gears give it a sporty ride quality. Easy handling and powerful disc brakes make it a great choice for navigating city streets or crowded bike paths in all types of weather. Whatever road or path you choose Escape Disc is always up for the adventure. Lightweight ALUXX frame smooth-rolling 700c wheels and confident upright positioning offer a balanced efficient ride quality. Powerful disc brakes and a wide range of gears help you increase your speed and tackle hills with more control. Puncture-resistant tyres and integrated rack mounts so rider can take on tough city streets and more adventurous rides. Please see below for delivery options for Giant Escape 1 Disc Sports Hybrid Bike 2019.